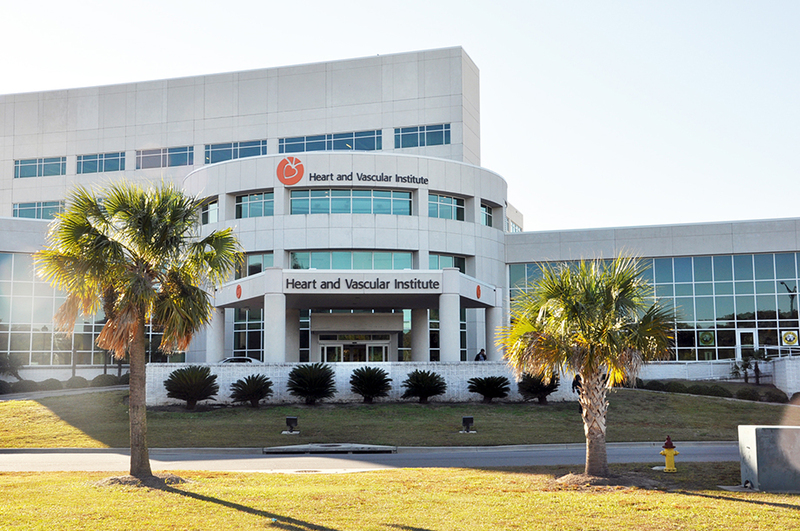 The staff of Chatham Engineering provided mechanical and electrical engineering for a new five-story Heart & Vascular Tower. This is the biggest capitol project undertaken at Memorial. The design for the utility systems provided capacity for the addition while integrating with the existing hospital systems so each system could feed both areas. Two new 1000 and 1500 ton high efficient centrifugal chillers with associated pumps and two cell ceramic cooling tower were installed in a new mechanical building. These were connected to the existing system so that the new and existing chillers can serve all areas in the hospital. Space and connection points were included for two future chillers. Heat exchangers were installed in the condensing water to pre-heat water for domestic use. A new 500 HP steam boiler was provided to replace a non-functioning boiler in the existing boiler plant and to provide redundant boiler capacity. Each of the tower floors is served from a dedicated air handling unit located in a mechanical penthouse. Each has a VFD controller with VAV control to allow for maximum comfort and high energy efficiency. Isolation rooms were provided with individual air pressure monitors to alarm in event of system failure. The energy management system from the existing hospital was extended to the new tower so that it would be controlled as one system. A smoke control system is provided for the lobby/atrium area. This is controlled from smoke control panel or automatically by lobby smoke detectors. Domestic water was provided to the new tower from the city’s system as well as from the hospital’s well. This provides redundant water service to the tower. It automatically selects the system with the higher pressure. New domestic booster pumps with VFD control provide adequate pressure to the new areas. Domestic hot water is pre-heated through the HVAC chillers and is heated using a steam fired water heater. Redundant hot water circulation pumps serve the new tower. All plumbing fixtures meet current low-flow and ADA requirements. Due to the high demand for medical gas systems demanded by ICU areas, extensive work was required. A new bulk oxygen tank system was installed to serve the entire Memorial campus. Two existing systems were removed. New emergency fill station was added. Capability for an expanded hyperbaric suite was included. Upgrades were made to the existing hospital distribution system with no downtime to allow for installation of shutoff valves. New medical air and vacuum lines were extended from the existing systems. Both systems were enlarged by adding two new pumps/compressors each with additional controls. New medical air outlets were provided in all ICU headwall units and where required by owner. Medical alarm panels were located in each area. The hospital’s primary electrical system was upgraded for the new tower. A new 600 amp 15kV vacuum interrupter was added to extend new primary loop system to serve new pad mounted transformers for the new tower. Each service is metered for internal energy monitoring. Normal and emergency systems were installed throughout the new tower. Normal panels were oversized to allow back feeding of critical care systems and redundant critical care feeders were installed in the ICU areas. A new 2000kw diesel generator was installed and interconnected with the hospital system to allow for redundant capacity for each area. The system operated as one but has a tie breaker in case isolation is needed. Six new automatic transfer switches were added for the new tower. The life safety and critical care switches were provided as closed transition type so there would be no outage during testing or retransfer. The lighting systems are predominantly fluorescent with high efficient electronic ballast. All dimming utilizes fluorescent dimming fixtures. Large areas such as the lobby are provided with metal halide fixtures. All exterior lighting is either high pressure sodium or metal halide and is controlled photo-on and either photo-off or time-off. All exit lights are LED type, which have an extremely long life and very low power requirements. A new addressable fire alarm system is provided in the new tower and is interconnected with the existing hospital system for common control and annunciation. The new building is provided with a lightning protection system interconnected with the existing system to provide a master labeled system.